← Is China India’s bigger problem? Many things are incomprehensible when pondering the post-Pulwama developments. The nature of the retaliation is one issue, and India’s reluctance to say anything, do anything, that would be taken askance by China, is another. If the idea of the aerial strike on the Jaish-e-Mohammad (JeM) training centre in Balakot in the Pakistani province of Khyber-Pakhtunkhwa was to send a message of India going fully punitive, display Indian resolve to hit the terrorists hard, and cause such losses as to signal clearly India’s willingness to escalate, and to escalate again, should the Pakistan military react to the initial IAF foray, then why was a PGM (precision guided munition) the weapon of choice? The 500kg glide bomb outfitted with the Israeli Spice 2000 terminal guidance set is very accurate and may, in fact, have penetrated the roof of the JeM hostel and killed off and incapacitated many trainee mujahideen/jihadis. But such a precision strike was inappropriate if the aim was to impact Pakistan and the world with wide-area destruction to take out the entire terrorist complex, which outcome, at a minimum, wouldn’t have been questioned or spawned, as has happened, an alternative Islamabad narrative of IAF Mirage 2000s dropping their ordnance harmlessly on some trees and scooting to avoid engaging with PAF aircraft in a dog fight. In light of disputed satellite imagery, the effect of the Indian strike was diluted and lost what deterrent value it had because it was seen to have, if not missed the target, then caused only minor damage. 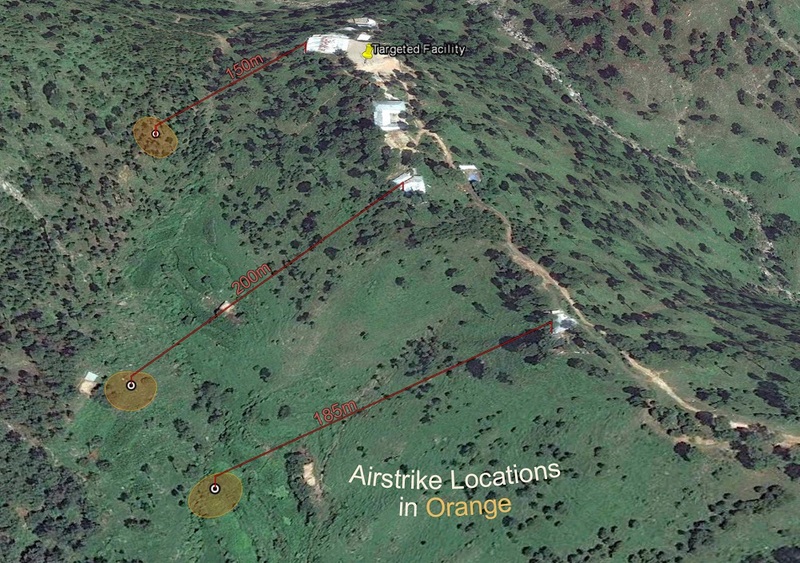 If massive area weapons – several 1,000kg bombs — to level much of the forested hilltop and the JeM facility were used instead and, post-attack, ‘Before’ and ‘After’ pictures with clearly labeled but destroyed terrorist support structures – hostels, arms depot, firing range, etc., been released to the Indian and international media, Islamabad would have had little wiggle room and the world would have been stunned into pondering a suddenly decisive India. So, the question arises: Why did IAF choose a PGM not an area weapon? If it did so under Prime Minister’s instructions to minimize collateral damage, then it apparently failed to inform Modi, or the latter was not properly briefed by his National Security Advisor, Ajit Doval, and the Intelligence agencies, that the selected JeM targets were, in fact, situated on a hill far from Balakot town, whence the possibility of civilian casualties was nil, and the use of wide-area destruction bombs was appropriate. True, this may have upped the pressure on PAF to respond in kind but to hit what targets and where? After all, Pakistan has never claimed that India is conducting a terror campaign inside Pakistan-occupied Kashmir. Had General Headquarters, Rawalpindi, in the circumstances chosen to escalate, target selection would have proved a major headache for it, because attacking military targets within India would have invited Delhi to up the ante by striking at tempting Pakistan military installations within easy reach of the border, and all-out war would have been risked that Pakistan was in no position to win. Further, had such conventional military exchanges tripped the nuclear wire, Pakistan wouldn’t have been able to prevent its own extinction as a social organism in return for the destruction of two Indian cities at most, owing to a very adverse ‘exchange ratio’ (the ratio of destruction absorbed to the destruction inflicted). In the event, rather than daring Pakistan to climb the escalation ladder, the Indian government and IAF were left defensively to argue their claims of Balakot damage in the face of world-wide skepticism based on satellite images that showed most of the structures still standing. The lesson to learn from this cross border anti-terrorist aerial strike is that to finish off a gnat it is sometimes necessary to use an elephant gun. So, two major goofs by the Indian Air Force: The incorrect choice of ordnance and the equally strange absence of the MiG-29 in operations. Sending up the old and venerable MiG-21bis against the F-16 while keeping the MiG-29, rated among the best maneuvering air defence aircraft, grounded, led to the embarrassment attending on an Indian pilot’s capture. These two mistakes point to something very wrong with IAF’s operational mindset and, naturally, with the conduct of operations. To match, the post-Balakot dud initiative at the UN Security Council (UNSC) showed up a deficient Indian diplomacy. Delhi revels in symbolic victories while our adversaries, in the main, China, seeks substantive gains. For the Narendra Modi government it was apparently enough that several Western nations, especially US, UK and France, voted for or co-sponsored the Indian resolution to designate Masood Azhar a global terrorist, when the odds of success were huge considering China’s veto on the anvil. The only proof, in this respect, Beijing may be convinced by is if JeM cadres hit Chinese troops in Xinjiang. Not content with the UNSC failure, Delhi has now exposed the country to further foreign depredations. By declaring that third countries are free to verify and validate India’s painstakingly accumulated evidence about the terrorist infrastructure inside Pakistan, it has handed China as well as US, UK and France the means to interpret whatever material Delhi provides them through the filter of their own national interests and contingent imperatives, adding still another layer of diplomatic complication. What happens the next time there’s a terrorist strike and India responds similarly? These states may choose to meddle by publicly doubting India’s reading of the threat as credible cause for its armed action, and thus put India in future diplomatic jeopardy. That this move was made with such little thought as to its ramifications speaks volumes about the impulsive thrust of Modi’s foreign policy. The Indian government still doesn’t understand that Beijing’s reasons for its veto have little to do with the piddling matter of JeM and Masood but with reassuring Islamabad that it can rely on China, against India anyway. The MEA, bereft of historical knowledge and basic strategic common sense, is yet to realize that China is playing the role for Pakistan that the erstwhile Soviet Union did for India such as during the 1971 Bangladesh War, when it provided political cover at UNSC to realize its goal in the then East Pakistan. And that Beijing won’t budge because the benefits from having Pakistan wage, in effect, a meta-level proxy war against India to serve China’s interests at little real cost is too tempting to pass up. But, why is it so easy for Beijing? Why has India not imposed any costs on China? Well, in the extant case, because MEA rates its own persuasive power very highly, which is reflected in its statement that Delhi will “show patience for as long as it takes” to bring Beijing around to conceding that Masood is, in fact, a bonafide terrorist. Such are the small stakes that the Modi regime envisions for the country. All things considered, the Balakot episode, it turns out, is only the latest instance in India’s ignominious history of drawing defeat from the jaws of victory. This entry was posted in Afghanistan, asia-Pacific/Indo-Pacific, Asian geopolitics, Bangladesh, China, China military, Culture, Decision-making, domestic politics, Europe, Geopolitics, Great Power imperatives, guerilla warfare, India's China Policy, India's Pakistan Policy, India's strategic thinking and policy, Indian Air Force, Intelligence, Internal Security, MEA/foreign policy, Military Acquisitions, Military/military advice, Nuclear Policy & Strategy, Nuclear Weapons, Pakistan, Pakistan military, Pakistan nuclear forces, Russia, society, South Asia, Strategic Forces Command, Terrorism, UN, United States, US., Weapons. Bookmark the permalink. Bharat Karnad ji little digression from topic, What do you think about India’s civilian Nuclear Energy Policy. After some digging it seems that Nuclear Power Plants are categorized in Generations in terms of overall characteristics. And slowly the aim of most countries is to create production level Gen 4 Nuclear Reactors. Most in the world as of now are Gen 2 and only some are Gen 3. Aim is to have economical and production worthy design by 2030. Now India due to its vast Thorium reserves has been developing a Thorium based Gen 4 Advanced Heavy Water Reactor. Given how India has vast reserves of Thorium and due to increasing demand in energy, I think the govt. should expedite the development so that not only do we have greater energy independence but also this could be used as a Foreign Policy tool to establish plants in other countries with huge Thorium reserves as well namely US, Australia etc. Not only that this would also be a huge revenue generator as well. One more advantage of such a reactor is that coupled with a FB reactor, we could also be independent in weapons grade Uranium. What are your thoughts on this? Should this not be pursued by the govt. with urgency so as to get a hold of the market and also have leverage over other countries? Going the Thorium route is to get back to Bhabha’s 1955 Plan for energy self-sufficiency, detailed at great length in my book ‘Nuclear Weapons and Indian Security’ and something I advocated to oppose the civilian N-deal with the US. In this context, the purchase of 1000MW reactors from US, Russia and France are an expensive distraction, diverting resources from advancing the country towards the Thorium reactors. After illegal sand mining in TN and kerala is it still possible to go thorium route??? Daily i pray for their demise…….God will answer my prayers soon……..Are they human beings? THOSE WHO ABUSE THE WEAK WILL BE PUNISHED BY THE STRONG as quoted in PRINICPLES OF NATURAL JUSTICE.. THEIR FAMILY ALL WILLL GO TO DRAIN…..NO MATTER THEIR ACCOMPLISHMENTS THEY WILL FALL FROM GRACE……NO ONE CAN STOP THEIR FALL……S RAJAS ESTIMATE ( BY GRACE OF GOD) NEVER FAILS…….EVEN THEY GO AROUND THE GLOBE 10 TIMES NO USE……..THEY WILL FAIL….WATCHING THEIR DEMISE IS A PLEASURE FOR ME….. WHAT THE COUUNTRY CANNOT DO GOD WILL DO….THE MIGHHTY GOD WILL PREVAIL. Either US has provided wrong data or some manipulation of GPS data was done. Can I ask a question here. I have been hearing that nuclear war will end Pakistan. Okay let us hope so. Now by your article, one or two of Indian cities will go too. What if Pakistan chooses India’s Favourite cities, No I am not talking about Mumbai or Delhi. What if they choose majority Hindu population (cities with a major Hindu population)and the holy cities. Examples are many, wont that in the climate generated by the last few years lead to a civil unrest of severe kind here ?. How will the Govt avoid it or how can they avoid that. That was a major fear which I get whenever there is a TV war going on. Please answer. It will only increase the public clamour for a decisive, annihilatory, response, won’t it? There have been several reports in Indian media that seem to suggest that selected journalists were shown the damage assessment reports including images of strike. One report has suggested that the images came from foreign SAR satellites and hence they were not publicly shared by GOI because of secrecy requirements imposed by them. Do you find that GOI made incorrect decision by not seizing the initiative and making irrefutable evidence public from day 1? This would have left little room for Pakistan to launch all the post Balakot propaganda they have engaged in. Is there still some lack in confidence in GOI at display? They seem to be half hearted in any action they take. All too eager to find a way out of any conflict. May be a result of capability gap? Yes. But there might not be “irrefutable evidence” because, assuming you took out the mole, the hill still exists! Whence my case that GOI/IAF should have used an area weapon to prevent any questions about the efficacy of the air strike.